After reading through “Secrets of the Dust” (SotD), I couldn’t wait to jump in and start playing. Before that, however, I need to talk about prepping the campaign. To begin with, there are a couple of issues that pale in comparison to how cool and pulpy the first adventure “Perchance to Dream” is. There is another adventure called “Destroyer of Worlds”, but I doubt my group will play it. The reason is because the setting goes back in time to before WWII and I really want to get from the Dreamlands in the first part back into the happenings and intrigues of WWII. But this will largely depend on which direction the players wish to go. Plus, SotD doesn’t present any of the Dust baddies like Frank von Stein and the Blutkreuz monsters and I will likely start statting out some of those guys. The even more minor issue is that there is one plot hole. At the beginning of the adventure, the A!C investigators are supposed to go to the Dust universe and then into the Dreamlands, but the book also says that the only connection between the Dust and A!C worlds is through the Dreamlands. That’s okay, though. We’ll correct this in our plot. In my campaign I’m having my players have two different characters at the outset of the game – one in each universe (A!C and Dust). Play sessions will go back and forth until the two groups meet up in the Dreamlands at which time the players will have to decide whether or not to continue this or mix the groups somehow. For the Dust characters, players will choose from the six pre-generated Ranger characters that are presented in the SotD appendix. The A!C investigators are going to be German double agents that are recruited to help Majestic. For this first couple of sessions for these characters, I will be running the A!C supplement called Kontamination. 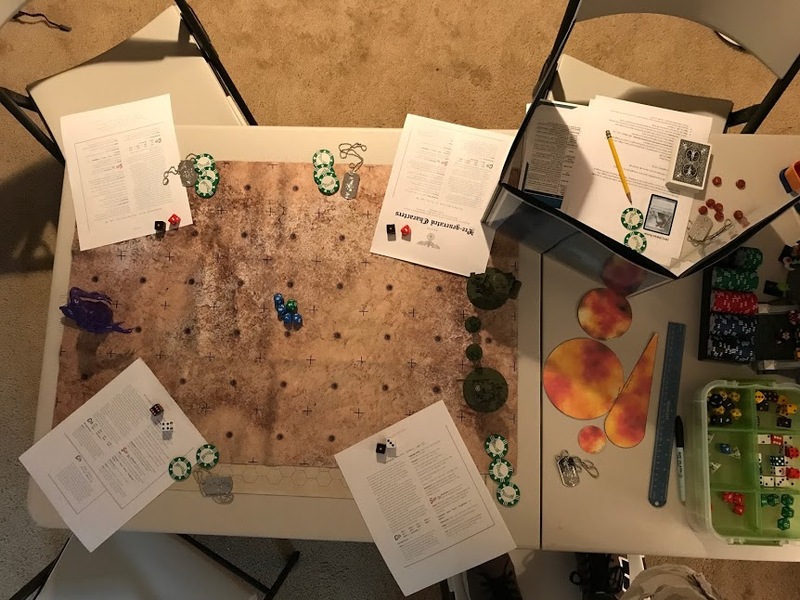 It is an interesting adventure that requires very little alteration for our purposes and also presents pre-generated investigators that the players can choose to run. The plot includes a Nachtwolfe plot using the machine invented by Crawford Tillinghast in the Lovecraft story “From Beyond” to drive Allied soldiers mad. The only change we’re making is to have the visions of the Beyond be of the happenings of a future as presented in the portion of SotD called “Congratulations! You’ve Brought on the Apocalypse!”. This should clue the investigators into a reason to warn the A!C version of Dr. Lowbeer. We’ll cover this again later on, though. 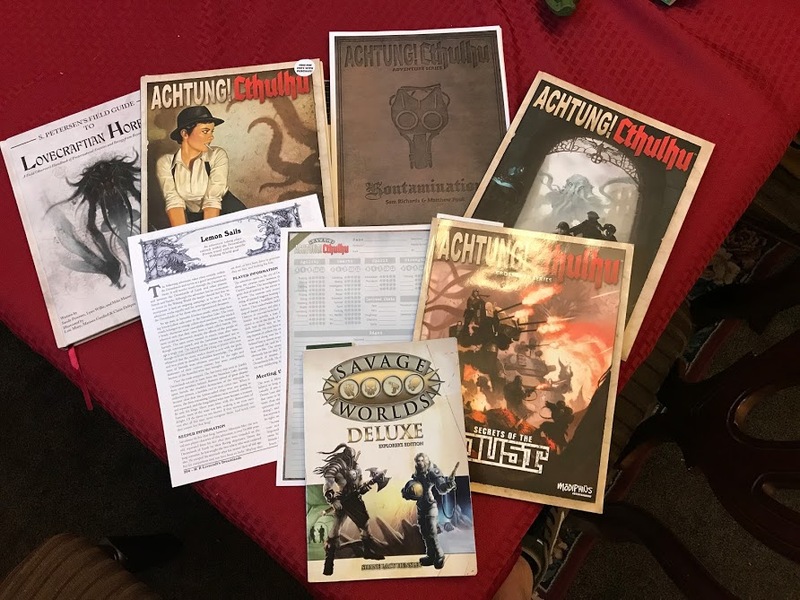 To begin things, I wanted to give the players a test of the world and show them the vibe that using Dust miniatures on Lovecraftian-type horrors brings. In order to do this, I created an encounter with an Eldrazi Ruiner from the Magic the Gathering universe. This actually comes from the miniatures board game called “Arena of the Planeswalker” expansion “Battle for Zendikar”. This can be used within the Dreamlands as a random encounter if the Keeper wishes. Here is the set-up with four Rangers (2 on foot and 2 in walkers). They are ready to roll their Spirit dice as they first behold the Eldrazi Ruiner. And here are the stats for the Eldrazi Ruiner and the spawn Eldrazi Scions. Begin in medias res with players using the Ranger team from Dust up until where the group enters Celephais (Episodes 1 -3 in SotD). Plot shifts to A!C universe in 1944 in the early days of the Battle of the Bulge with players using their A!C investigators (Kontamination entire adventure). At the end, the characters will be recruited by Sergeant Miller (Majestic agent) which leads to Dr. Lowbeer sending the investigators into the Dreamlands to meet up with the Dust Rangers in Celephais. After the 2 teams meet, the NPC Mironim-Mer will be encountered in Celephais in order to add more sandbox-style opportunities for the group to choose from. This encounter is called “Lemon Sails” and is included in Call of Cthulhu’s Dreamlands supplement. The group could very well split back into two groups: one group helping Mironim-Mer and the other group continuing to search for the USS Eldridge elsewhere. Coming up next will be the summary of play through these initial stages of the campaign.